The Best Hamstring Building Tips And Workouts From The Forums! 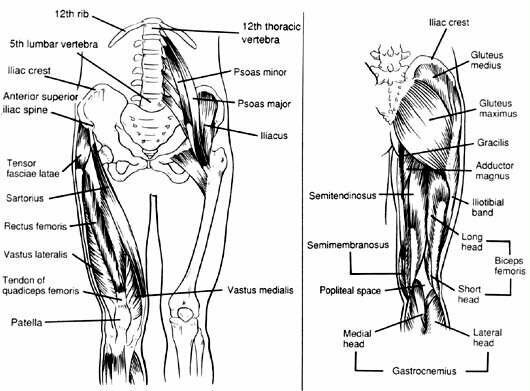 In this article you will learn about the hamstrings and how they function. You will also get some great hamstring building tips and workouts from your peers on the forum. Check them out and see if they would work for you! Well, by now I am hoping that you have already read some of my articles, especially the recent one on the calves. Well, here is part 2 in my 'wheels' [Best Leg Training From The Forums] series, this time featuring the hamstrings. In this article, you will not only learn about the hamstrings and how they function, but you will also get some great hamstring building tips and workouts from your peers on the forum. So, sit back and enjoy! All three of these muscles originate under the glutes (particularly on the pelvic bone), and they attach all the way down on the tibia of the lower leg. These muscles are used for knee flexion and hip extension. Knee flexion (an example would be a leg curl) is where you are bringing your heels towards your glutes. Hip extension (an example would be stiff-legged deadlifts) is where you are moving your leg to the rear. The biceps femoris has two heads (short head and long head). The short head begins between the adductor magnus (a hip extender which originates on the lower portion of the ischial tuberosity and is inserted onto the adductor tubercle just below the medial condyle on the tibia) and vastus lateralis and extends up roughly as high as the insertion of the glutes. The long head begins from the lower and inner impression on the backside of the tuberosity of the ischium (on the hip). The semimembranosus is found at the back and medial side of the thigh. It originates from the upper and outer impression on the tuberosity of the ischium (on the hip), specifically higher than and on the side to the biceps femoris and semitendinosus. From there it is inserted into medial condyle of the tibia. The semitendinosus is found at the posterior and medial area of the thigh. It originates from the lower and medial impression on the tuberosity of the ischium (on the hip) and inserts into the upper part of the medial surface of the tibia. 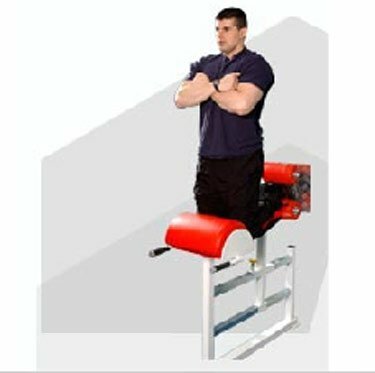 You can do glute-ham raises by having someone sit on your feet, so you can use your arms if you can't do your whole body weight. It's important that you keep your abs squeezed tight as you lower yourself down. 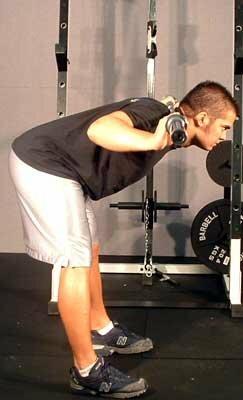 As you reach the bottom, have your hands ready to meet the ground and push off to the point where you can pull yourself back up using your hamstrings. Push off lightly however - as you want your hamstrings to handle most of the work. I also found that I can stick my feet under my bed, and put a towel under my knees and do them that way. SLDL (Stiff-legged deadlifts)/RDL (Romanian deadlifts) are the best IMO (in my opinion). Stiff-legged deadlifts work the hammies real goooooood. The first time I did them I couldn't walk for 3 days! LOL. Lay face down on a bench with a DB between your feet, old school. Here is one that is a huge killer. Start slow or pay the price!! Free body "leg" curls. Lying face down, put your heels under the pad of a sit up bench. Now, using your hamstrings, curl yourself up!! You can use a broomstick to support yourself. 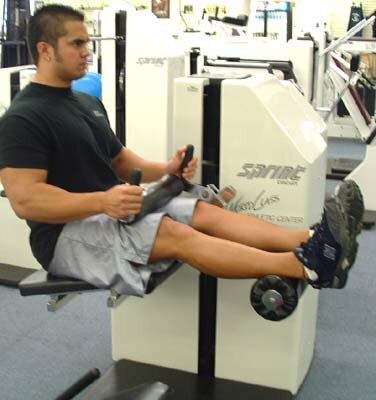 You can also do leg curls off of a bench with a DB between your feet. I like SLDL with dumbbells. 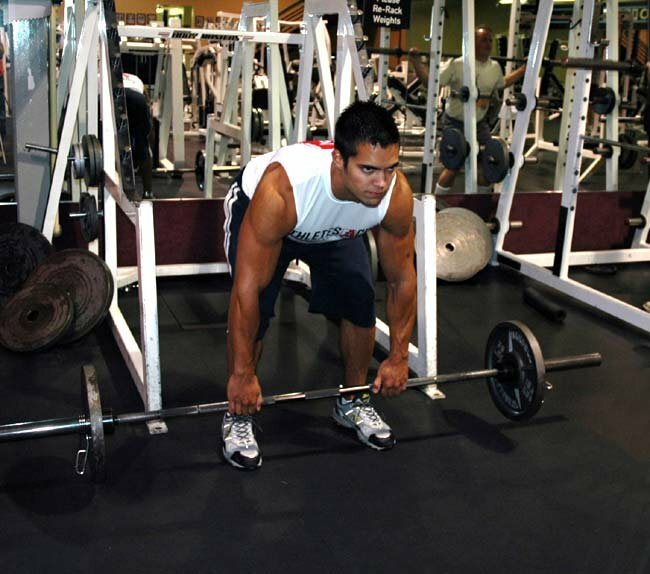 At the bottom, bring the weights out to the sides so you end up with your hands beside your ankles. I get a better stretch and a little more isolation in my upper hams that way. Squat, a$$ to ankles; conventional deads; RDL; GHR (glute-ham raise). As said, SLDL and lunges. Good Mornings are also really useful for hamstring development. Stiff Leg Barbell Good Morning. Best exercises period for hamstrings are SLDL and Good Mornings, in that order, IMO. 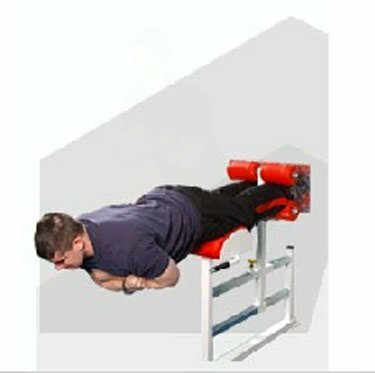 SLDL are primarily a hamstring exercise, while GM's are usually thought of as a lower back movement, but both are great for both body parts. Form and mind-muscle link are very important. I recommend you do those two movements followed by your machine's standing leg curls. (Just please don't make a thread asking if you should do one leg at a time or both). 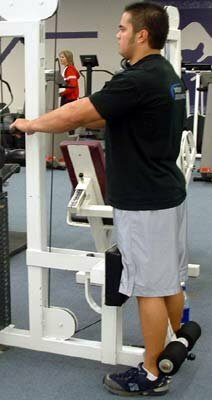 Lying Leg Curls never did anything for me, personally, but I feel standing leg curls on a low cable with an ankle strap work really well. But for me, SLDL is number one because my hams have always lagged and I need that direct, heavy work on them. 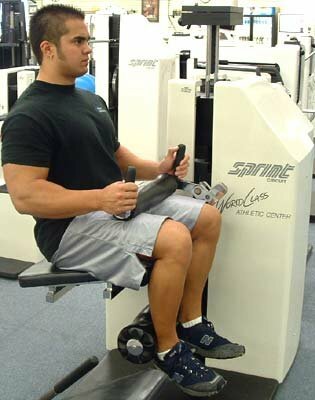 You simply can't go heavy on curls safely or effectively, though they are valuable companions to SLDL's. Another vote for Glute-Ham Raises here. I've always been a huge fan of stiff-leg deadlifts for hams, and was very skeptical of GHR's, but I have seen the light! They are really the only exercise that works the hammie through its full range of motion. I still do stiff legs, and I love Good Mornings for their strength benefits, as well as carry over to squats and deadlifting, but glute ham raises are always in my leg workouts these days. Train hammies only once per week. Mine really started getting nice and ripped when I switched to heavy dumbbells for my SDL's, hypers holding a heavy DB, and lying leg curls, really heavy. Afterwards, spend a good 10-15 minutes stretching them out. This'll do wonders for definition. Aside from the best exercise, SLDL, a lot of times I'll finish up my ham routine with Good Mornings. I'll usually keep the weight fairly light to reduce chances of injury and also concentrate on keeping the emphasis on my hams. 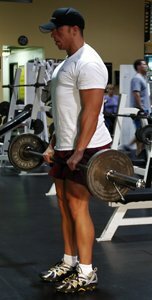 If you think your hams are really lagging, you can use some variations on the stances of your quad exercises to shift more emphasis to your hams; place your feet higher on the leg press, go deeper with your squats, etc. 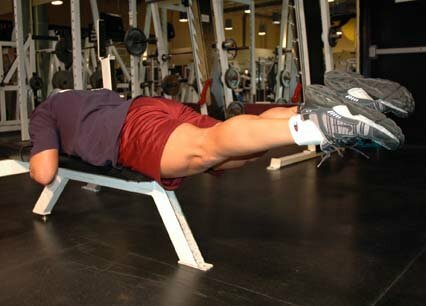 For hams, I do two exercises: leg curl and SLDL - 4 sets each. They also get hit indirectly while doing other leg work like squats, leg press, and regular deadlift. I like to use leg lifts to pre-fatigue my hamstrings, then go to SLDL's... as far as switching things up and how often, some exercises you can't really replace - so you look to other ways to switch things. You don't always have to change an exercise to switch things up. You can change the order in which you do the exercises by changing your rep ranges. For example, if you were doing 4 sets of 12, you can add weight and do 3 sets of 6 or 4 sets of 8 - change how long you rest in between sets; any of those will work to stop the exercise from getting stale. Good luck, and "give me one more rep...!" Stay tuned for my final installment in the 'wheels' series: "Best Quad Workouts From The Forums!"